Introduction: Satisfaction evaluation is an excellent opportunity to involve clients in the process of assessing programs from users' perspective and is recognized as a component of quality of care. 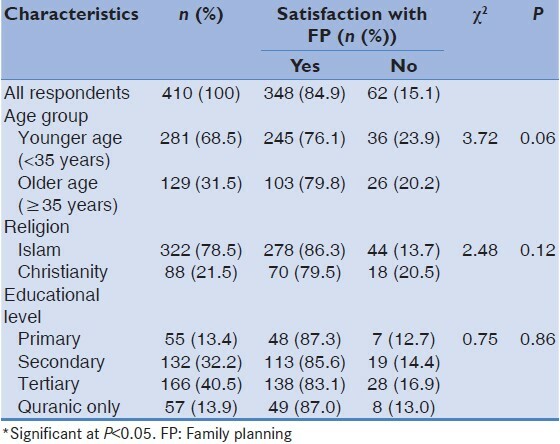 This study aimed to identify determinants of client satisfaction with the family planning (FP) services provided in government health facilities in Sokoto metropolis. Materials and Methods: A descriptive cross-sectional study was conducted among FP clients that patronized the FP commodity delivery point in selected health facility in Sokoto, Northern Nigeria. A multi-stage sampling technique was used to select the study respondents. List of the clients that attended each clinic was compiled and used as a sampling frame. A set of pretested exit interviewer-administered questionnaire was used to collect data from the clients. Ethical approval was granted for the conduct of the study, and individual informed consent was obtained from each client. Thereafter, the exit questionnaire was administered. Results: All the respondents were females and those aged 25-29 years constituted a larger proportion of 26%. Overall mean age was 30.8 ± 7.0 years. Large proportion (85%) expressed satisfaction with FP services provided. About 49% of the respondents reported waiting for 30 min before being attended to by service providers while 13% waited for more than 2 h. Average waiting time was 60.3 ± 21.3 min with clients mean desired waiting time of 35.2 ± 11.1 min. Clinic waiting time, being examined during the visit, and attitude of both service providers and other clinic staffs were found to be the key determinants of client satisfaction. Conclusion: Although, most of the clients waited for more than 30 min, majority were satisfied with the services offered. There is a need to reduce waiting time of FP clients at the clinic and ensure clients are appropriately examined. Quality of health services is increasingly becoming topical in the healthcare industry probably due to the high cost of modern interventions. As such, stakeholders in the industry such as governments, health managers, and consumers are placing high premium on health care quality. Assessment of healthcare quality in terms of its outcome has advantage as an indicator of service effectiveness and as a component of monitoring system focused at improving care quality as well as early detection of system deviation. Studies assessing quality of care generally measure one of the three types of outcome: Medical outcomes, costs, and client satisfaction. For client satisfaction which is postconsumption evaluation, clients assess not their own health status after receiving care but their satisfaction with the services provided. Client satisfaction has been recognized as an essential component in the evaluation of health care quality. , Thus, its assessment is an important input to improving the quality of health system and also provides an opportunity for monitoring and evaluation from a consumer perspective which provides feedback for health care providers and policy makers. According to Donabedian, (1980) client satisfaction is a fundamentally important measure of the quality of care because it offers information on the provider's success at meeting those expectations of most relevance to the client. Therefore, better understanding of the determinants of satisfaction will help policy and decision-makers, healthcare managers, and service providers to implement programs in a client-centered manner without compromising technical aspect of care. Factors associated with satisfaction are thought to include the structure, process, and outcome of care, as well as patient sociodemographic, physical and psychological status, and attitudes and expectations concerning medical care. Studies in Southern Nigeria identified waiting time, how clients were treated by both the service providers and other facility staff, privacy and information provided on how FP commodity in use work as key determinants of satisfaction. , Similarly, in Ghana, Kenya, and Tanzania, the correlates of satisfaction were found to be clients being treated respectfully, receive service needed or desired and waiting time. Structural aspect of quality such as counseling and provider motivation and also process aspect of quality such as interpersonal and technical competence were important determinants and associated with client satisfaction. However, client waiting time and service availability were the major determinants of their satisfaction. This study aimed to identify determinants of client satisfaction with FP services provided. Sokoto state is made up of 23 local government areas (LGAs), of which four are metropolitan. This study was conducted in Sokoto metropolitan LGAs which included Sokoto North, Sokoto South, Wamakko, and Dange-Shuni LGAs. The health facilities are disproportionately distributed among the LGAs; Sokoto North-13, Sokoto South-12, Wammako-40, and Dange-Shunni-21 health facilities of which 11, 10, 19, and 13 health facilities, respectively, were providing FP services at the time of the study. There were a total of 53 health facilities that were providing the FP services. The clinics serve both new acceptors and continuing users daily from Monday to Friday. Follow-up appointment is given to clients based on the duration of refill for each method in use while 1-month appointment is given to new acceptor. The study population were clients who patronized the FP service delivery point of the selected health facilities. There were no exclusion criteria except for clients that refused to participate and for those that were not in the clinic during the period of data collection. A descriptive cross-sectional study designed was used to identify the determinants of client satisfaction with FP services. Using sample size formula for descriptive study,  and an adjustment for attrition factor due to nonresponse to part or whole of questions by respondents and/or loss of questionnaire,  a sample size of 410 was obtained. A multi-stage sampling technique was used to select the study participants. At the first stage, six health facilities were selected from each of the LGAs by simple random sampling method (balloting technique). A total of 24 health facilities out of 53 providing FP was selected. In the second stage, from each health facility selected, a random sample of the required proportion was independently allocated to each health facility (probability proportional to the size). In this case, average client load for each facility 3 months preceding data collection was used for proportional allocation, and this resulted in an unequal number of clients being selected from the facilities. At the third stage, clients were selected using a simple random sampling method (balloting technique). The list of clients that consented to participate on each clinic day was compiled and served as a sampling frame. A simple random sampling method (balloting technique) was used to select respondents on each clinic day until the allotted sample size for each facility was obtained. An interview-administered exit questionnaire was used to collect data from the respondents. The questionnaire was pretested on 20 clients from another clinic that was not used for the main study. An exit interview was conducted after a client have completed all clinic procedures and on her way home. Research assistants were selected and adequately trained to ensure adequacy and accuracy of the information to be collected during exit interviews. No health service personnel were involved in collecting data, and the exit interview was conducted outside the health facility in order to minimize "courtesy bias." Many clients express more satisfaction with services delivered than they actually feel in order to be polite or because they are afraid of being identified. Data on consultation and waiting time were collected by different group of field workers. Ethical approval for the conduct of the study was obtained from the Usmanu Danfodiyo University Teaching Hospital Research Ethics Committee and in addition, individual informed consent was also obtained from each respondent. Confidentiality and privacy were maintained throughout the conduct of the study and questionnaires were anonymous. Client level of satisfaction was determined by asking whether they were satisfied with the services received or not, and then a direct assessment of four levels of satisfaction (very satisfied, somewhat satisfied, somewhat dissatisfied, and very dissatisfied). However, for the ease of binary logistic analysis, the levels were merged and categorized into satisfaction or dissatisfaction. Data collected were analyzed using Statistical Package for the Social Science version 17.0. Mean and standard deviation were determined for normally distributed continuous variables while frequencies and percentages were carried out on categorical variables. The results were presented in tables and charts. 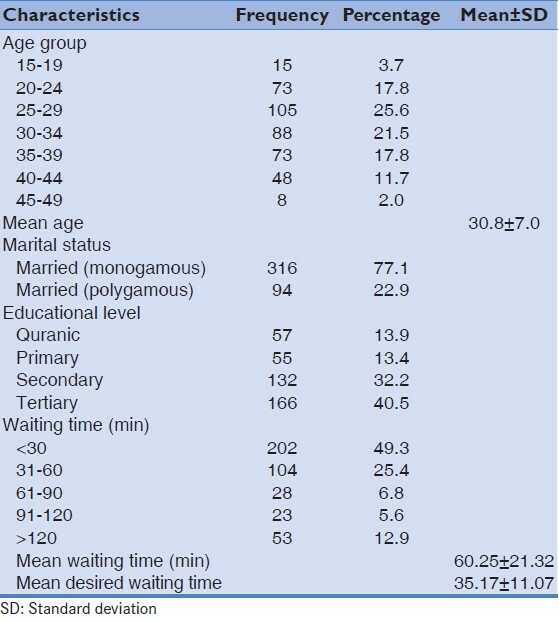 Chi-square test of association was carried out to examine the relationship between sociodemographic characteristics of respondents, some clinic factors (e.g., waiting time, clinic working environment, opportunity to ask question, etc.) and client satisfaction. The outcome variables for satisfaction were: Highly satisfied, satisfied, somewhat satisfied and not satisfied. The outcome was dichotomized into satisfied and not satisfied by combining highly satisfied, satisfied, somewhat satisfied into one variable, satisfied. Multivariate logistic regression analysis was carried out to examine the relationship of independent variables with the outcome and to identify the key determining factors influencing satisfaction with FP services provided among the respondents. During the multivariate analyses, a forward regression model was used where all the independent variables were simultaneously entered into the regression equation at once to examine the relationship between the whole set of predictors and outcome variable. Significant level α, for the bivariate and multivariate analysis, was set at 5% at 95% confidence level. Result in [Table 1] shows that all the respondents were female and married, with 77% in a monogamous union and 23% polygamous union. They all had childbirth before initiation of contraceptive use. Majority (68.6%) were aged below 35 years, and those aged between 25 and 29 years constituted 25.6% of the total. Mean age of respondents was 30.8 ± 7.0 years. Majority (41%) of respondents had tertiary education while 14% had Quranic education alone. Significant proportion (49%) of the respondents waited for <30 min before being attended to by service providers while 13% waited for more than 2 h. Average waiting time was found to be 60.3 ± 21.3 min while clients mean desired waiting time was 35.2 ± 11.1 min. [Table 2] result shows that Majority (77%) of the respondents were old clients. Of these, 3.9% stopped the method in use while 1.7% switched to another method. 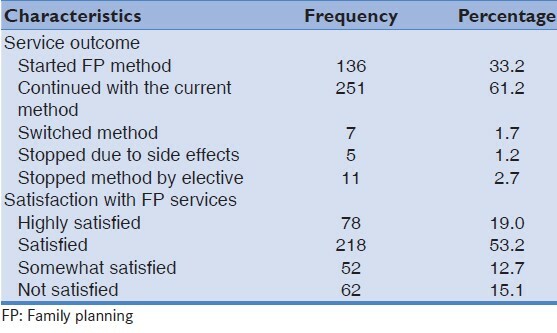 New acceptors of FP method were 33%. Majority (84.9%) of the respondents expressed satisfaction with services while 15.1% were not satisfied. The chi-squared analysis in [Table 3] shows that there was no statistically significant association between sociodemographic characteristics of the respondents and satisfaction, age (χ2 = 3.72; df = 1, P = 0.06), religion (χ2 = 2.48; df = 1, P = 0.12), and educational level (χ2 = 0.75; df = 3, P = 0.86). The result of bivariate analysis in [Table 4] shows that result above showed a statistically significant association between clients satisfaction and waiting time (χ2 = 20.89; df = 1, P = 0.0001), client being examined (χ2 = 23.80; df = 1, P <0.0001), cleanliness of the facility (χ2 = 8.61; df = 1, P = 0.003), how clients were received by provider (χ2 = 55.42; df = 1, P = 0.0001) and other staff of the clinic (χ2 = 15.72; df = 1, P = 0.001), FP commodities availability (χ2 = 12.21, df = 1, P = 0.01), ability to ask question comfortably (χ2 = 14.21, df = 1, P = 0.03), and adequacy of information provided (χ2 = 23.80, df = 1, P = 0.01). There was no observed association with privacy (χ2 = 0.77, df = 1, P = 0.38), (χ2 = 4.22, df = 1, P = 0.04), hours of the day service are available (χ2 = 0.90, df = 1, P = 0.34) and number of clinic days (χ2 = 1.84, df = 1, P = 0.18). The logistic regression analysis in [Table 5] result The result indicated that waiting time, how the clients were received by both the providers and other clinic staff, having been examined during the visit and sanitary condition of the facility were found to be the key factors influencing satisfaction by users. Respondents who waited for a short time were about 8 times more likely to be satisfied with services (adjusted odds ratio [aOR] =8.06, P = 0.001). Clients that were treated with respect and dignity by both the service providers and other clinic staff were 6 and 2 times, respectively, more likely to be satisfied (aOR = 6.44, P = 0.001 and aOR = 1.688, P = 0.01). Likewise, clients that patronized facilities that have good sanitary condition were more likely to be satisfied with the clinic services. Client satisfaction has been described as a key to clients' decisions to use and to continue using services or willingness to return for future services. The assessment is a feedback which is an incentive to service providers to do their job better. However, assessing satisfaction can be difficult, partly due to the multifaceted nature of the concept. Exit interview survey method is good to conduct as it is easy and focuses clients' perspectives. However, this method receives subjective responses and courtesy bias. Thus, there is a potential risk that may lead to contamination of the data collected. Respondents usually would not want to express negative opinion to strangers on their level of satisfaction, and this could have resulted to overestimation of reported level of satisfaction with FP services. The research team thanked the staff of Department of Community Health who provided some technical support during the course of this work including the research assistants. There was no funding made available for the research work and as such the authors hereby declared that they have no conflict of interest. Smith KB, Humphreys JS, Jones JA. Essential tips for measuring levels of consumer satisfaction with rural health service quality. Rural Remote Health 2006;6:594. Blumenfeld SN. Quality assurance in transition. P N G Med J 1993;36:81-9. Chu-Weininger MY, Balkrishnan R. Consumer satisfaction with primary care provider choice and associated trust. BMC Health Serv Res 2006;6:139. Donabedian A. The Lichfield lecture. Quality assurance in health care: Consumers' role. Qual Health Care 1992;1:247-51. In Laila A, Mohammad JU. Factors determining inpatient satisfaction with hospital care in Bangladesh. Asian Soc Sci 2011;7:14-15. Derose KP, Hays RD, McCaffrey DF, Baker DW. Does physician gender affect satisfaction of men and women visiting the emergency department? J Gen Intern Med 2001;16:218-26. Bara AC, van den Heuvel WJ, Maarse, JA, van Dijk JP. Users' satisfaction with the Romanian health care system: And evaluation of recent health care reforms. Eur J Public Health (Suppl) 2002;12:39-40. Donabedian A. Exploration in Quality Assessment and Monitoring: The Definition of Quality and Approaches to its Assessment. Vol. 1. Ann Arbor, MI: Health Administration Press; 1980. In Laila A, Mohammad JU. Factors determining inpatient satisfaction with hospital care in Bangladesh. Asian Soc Sci 2011;7:16-17. RamaRao S, Lacuesta M, Costello M, Pangolibay B, Jones H. The link between quality of care and contraceptive use. Int Fam Plan Perspect 2003;29:76-83. Dwyer J, Jezowski T. Quality Management for Family Planning Services; Practical Experience from AFRICA AVSC Working Paper Number 7. New York: AVSC international 1995. p. 1. Mendoza Aldana J, Piechulek H, al-Sabir A. Client satisfaction and quality of health care in rural Bangladesh. Bull World Health Organ 2001;79:512-7. Minnick AF, Roberts MJ, Young WB, Kleinpell RM, Marcantonio RJ. What influences patients' reports of three aspects of hospital services? Med Care 1997;35:399-409. Kiyunu YA. Clients' perception of quality of family planning services in urban and rural health facilities in Lagos State. J Community Med Prim Health Care 2010;221:6-14S. Uzochukwu BS, Onwujekwe OE, Akpala CO. Community satisfaction with the quality of maternal and child health services in Southeast Nigeria. East Afr Med J 2004;81:293-9. Hutchinson P, Do M, Sohail A. Client Satisfaction and the Quality of Family Planning Services: A Comparative Analysis of Public and Private Health Facilities in Ghana, Kenya, and Tanzania. Bethesda: BMC Health Services Research; 2009. Agha S, Do M. The quality of family planning services and client satisfaction in the public and private sectors in Kenya. Int J Qual Health Care 2009;21:87-96. Ibrahim T. Research Methodology and Dissertation Writing. Abuja: Cress Global Links Ltd.; 2010. p. 118. Kirkwood RB, Jonathan AC. Essential Medical Statistics. 2 nd ed. Massachusetts, USA: Blackwell Publishing Ltd.; 2003. p. 423. Kats K, Hardee K, Villinshi MT. Quality of Care in Family Planning. A Catalogue of Assessment and Improvement Tools. Durha, North Carolina: Family Health International; 1993. p. 215. Rao KD, Peters DH, Bandeen-Roche K. Towards patient-centered health services in India - A scale to measure patient perceptions of quality. Int J Qual Health Care 2006;18:414-21. Ruth EB, Charles K. The Quality of Family Planning and Antenatal Care Services in DISH and Comparison Districts in Uganda. MEASURE Evaluation Bulletin; 2001. Elisa W. Family Planning Counselling: Meeting Individual Client Needs; 1995. De Silva U, Fonseka P. Quality of care in government family planning clinic services in Colombo District. Ceylon Med J 2008;53:121-7. MacCarthy J, Maine D. Frame work in analysing the determinant of maternal mortality. Stud Fam Plann 1999;23:26-7. Siam LC, Diamon I. When fertility seems too high for contraceptive prevalence: An analysis of Northeast Brazil. Int Fam Plann Perspect 1995;21:59. Ringheim K. Evidence for the acceptability of an injectable hormonal method for men. Fam Plann Perspect 1995;27:123-8.